Frederick Orlin Tremaine (January 7, 1899 – October 22, 1956) was an American science fiction magazine editor, most notably of the influential Astounding Stories . He edited a number of other magazines, headed several publishing companies, and sporadically wrote fiction. In 1921, he graduated with a B.O. degree from the College of Arts and Sciences, Valparaiso University, Indiana. At Valparaiso, he was active in his fraternity, participated in drama, and worked on the weekly school newspaper, The Torch. A sporadic fiction writer, his first known published story, One Burning Minute, received serialized newspaper syndication in August-October, 1926. Soon after, his first known pulp story, "The Throwback," appeared in Weird Tales (October 1926) under the pseudonym Orlin Frederick. In early 1928, he was slated to be editor of a new Christian magazine, Crossroads. No issues are known of. Later in 1929, he joined the Clayton pulp publishing chain. He edited Miss 1929, soon renamed Miss 1930. After four issues, Miss 1930 was sold to Tremaine's Perennial Publishing Company, presumably part of Tremaine's departure from Clayton. Tremaine intended to continue editing Miss 1930, but there are no known issues for Perennial. 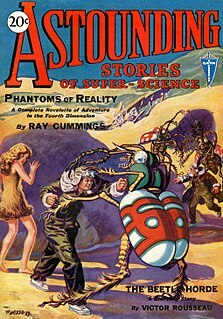 In the December 1933 issue of Astounding, Tremaine's third as editor, his editorial "Thought Variant" encouraged contributing authors to seek new ideas for science fiction stories. According to Alva Rogers, "the thought variant policy was largely responsible for the rapid rise of Astounding to top position in the science fiction field." During the fifty issues of the magazine he edited, Tremaine launched the careers of authors L. Sprague de Camp, Eric Frank Russell, and others. In late 1937, Tremaine hired John W. Campbell, Jr. to replace him as editor of Astounding, while Tremaine was appointed Editorial Director of Street & Smith, a position he held for a year before departing Street & Smith during a management shake-up. From mid-1939 through at least 1941, he ran his own New York book publishing company, the Orlin Tremaine Company. (See separate listing of publications below.) On June 23, 1941, an associate editor of the firm, William M. Gibson, was convicted of extortion. He and Prince Ludovic Pignatelli of Italy had threatened the prince's cousin, Prince Guido Pignatelli, with publishing a book that would challenge Guido's right to his title unless they were paid $50,000. The timing roughly corresponds with the last-known publications of the Orlin Tremaine Co., but it is unknown whether the two events are related. Simultaneous to his publishing ventures, Tremaine produced the science fiction pulp Comet , which ran five issues from December 1940 to July 1941. Also, from late 1939 through early 1940, Tremaine published four stories in pulps as diverse as Thrilling Wonder Stories and South Sea Stories. During World War II, Tremaine edited the magazine Plus, distributed to war industries, and edited government manuals for the armed forces. At roughly this time, Tremaine had his most productive period as a fiction writer, contributing numerous stories to detective pulps (1944-45). A series for Detective Tales featured a character named Easy Bart. When the war ended, Tremaine became an editor for Bartholomew House, which published the first paperback editions of Lovecraft, The Weird Shadow Over Innsmouth (1944) and The Dunwich Horror (1945). He also published a revision of T. C. McClary's novel Rebirth (first appearance in Astounding Stories) while at Bartholomew House. In less than a year, he was describing himself as a "free lance writer." The current record does not indicate much success as a writer. His next known publications appeared in late 1948 and early 1949. In the early 1950s, under the name Arthur Lane, Tremaine was an editorial associate for the pulp Marvel Science Stories . His greatest success appears to have been with Street & Smith, and his most lasting contribution his editorship of Astounding. The rest of his career illustrates the vicissitudes of the publishing business. Will Murray, "The Man Who Edited Lovecraft," Crypt of Cthulhu No 48 (St Johns Eve 1987): 3-5. Alec Nevala-Lee, Astounding: John W. Campbell, Isaac Asimov, Robert A. Heinlein, L. Ron Hubbard, and the Golden Age of Science Fiction (NY: Dey St. Books, 2018). Alva Rogers, A Requiem for Astounding (Chicago: Advent:Publishers, 1964). Eric Frank Russell was a British author best known for his science fiction novels and short stories. Much of his work was first published in the United States, in John W. Campbell's Astounding Science Fiction and other pulp magazines. 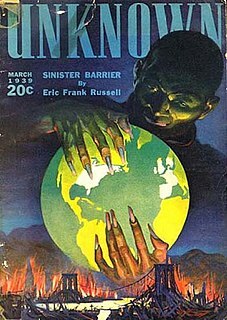 Russell also wrote horror fiction for Weird Tales and non-fiction articles on Fortean topics. Up to 1955 several of his stories were published under pseudonyms, at least Duncan H. Munro and Niall(e) Wilde. Harold Brainerd Hersey was an American pulp editor and publisher, publishing several volumes of poetry. His pulp industry observations were published in hardback as Pulpwood Editor (1937). The Other Worlds is an anthology of science fiction, fantasy, and horror stories, edited by Phil Stong. It was originally published by Wilfred Funk in 1941, with a lower-price edition following from Garden City Publishing a year later. The Encyclopedia of Science Fiction describes it as "the first important sf Anthology". ; it remains in the collection of nearly 200 academic libraries in 2015. 1 2 3 4 "F. Orlin Tremaine, Editor, Publisher" (obituary), New York Times , October 24, 1956. ↑ The Torch, May 20, 1922. ↑ The Torch, mastheads, April-May 1920. ↑ The Torch, announcement, August 6, 1920; mastheads, September 1920 through May 1921. ↑ The Torch, October 21, 1921. ↑ The Torch, August 4, 1922. ↑ The Torch, May 30, 1923. ↑ The Torch, June 13, 1923. ↑ "Magazines for February," Galena Times (Kansas), January 31, 1924. ↑ F. Orlin Tremaine, Short Story Writing (Emmaus, PA: Rodale Press, 1949), 31-32. 1 2 3 4 5 6 The Author & Journalist, various market reports. ↑ "Publishing Syndicate Formed in Springfield," Bridgeport Telegram , August 18, 1927; "Phelps Publishing Co. Deal Collapses," The Burlington Free Press , October 11, 1927. ↑ "Incorporations," Wilmington Morning News (Delaware), November 4, 1927. ↑ "Incorporations," Wilmington Morning News (Delaware), January 17, 1929. ↑ The Torch, February 16, 1928. ↑ The Torch, Tremaine credited, May 20, 1950. ↑ Alva Rogers, A Requiem for Astounding (Chicago: Advent Publishers, 1964). ↑ Associated Press, "Extortion Charge Brings Sentence of Pignatelli," June 23, 1941. ↑ "Science Moving Too Fast, Say Fantastic Fiction Fans," Newark Star-Ledger, March 4, 1946. ↑ Dustwrapper biographical text, Short Story Writing. ↑ The Torch, May 20, 1950.